In this video we will discuss, how to add required attribute dynamically in template driven forms. In our upcoming videos we will discuss how to do the same in reactive forms. Example : Consider the following 3 fields. 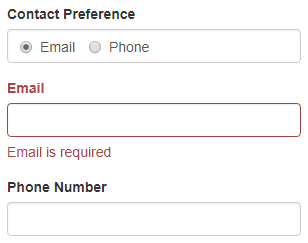 If "Email" is selected as the "Contact Preference", then "Email" input field is required. 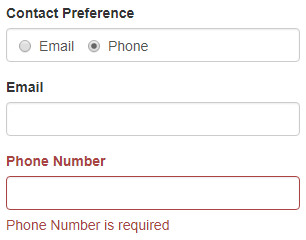 If "Phone" is selected as the "Contact Preference", then "Phone" input field is required. <input type="radio" required #contactPreference="ngModel" name="contactPreference"
We made the contact preference field required, by including required attribute on both email and phone radio buttons. At this point view the page in the browser and notice the selected radio button value. When email radio button is selected we see the selected value as email, and when phone radio button is selected, we see the selected value as phone. 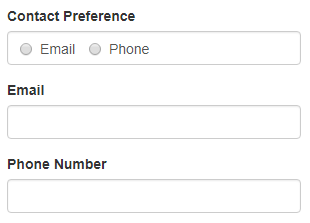 We will use this selected contact preference radio button value (contactPreference.value) to dynamically add or remove required attribute to phone and email input fields. Notice the required attribute. We assigned it a boolean expression (contactPreference.value=='email'). This boolean expression dynamically adds or removes required attribute to the email field depending on whether email contact preference radio button is selected or not. Phone Number input field HTML : Notice the boolean expression assigned to the required attribute. This boolean expression dynamically adds or removes required attribute to the phone number field depending on whether phone contact preference radio button is selected or not.